We are officially 4 weeks away from going back to school! School is starting a week later than usual this year, but it's crunch time! I want to get everything organized and ready for the first day of school. Between planning a combined birthday party, celebrating Liam's 2nd Birthday, and going on vacation, I don't have that much time to complete my Back to School projects! 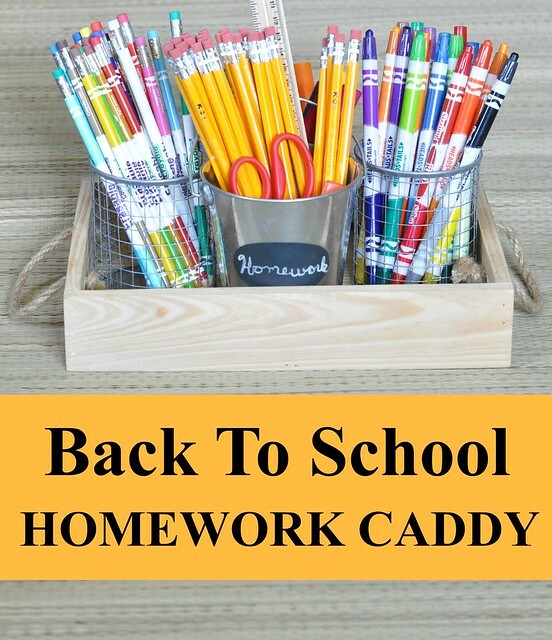 The first project on my list was setting up our Homework Caddy for the upcoming school year! I put together a simple Homework Caddy for the second half of the past school year, and it was a game changer! I really wish I did it years ago. Everything we needed to do homework or draw pictures was within easy reach! 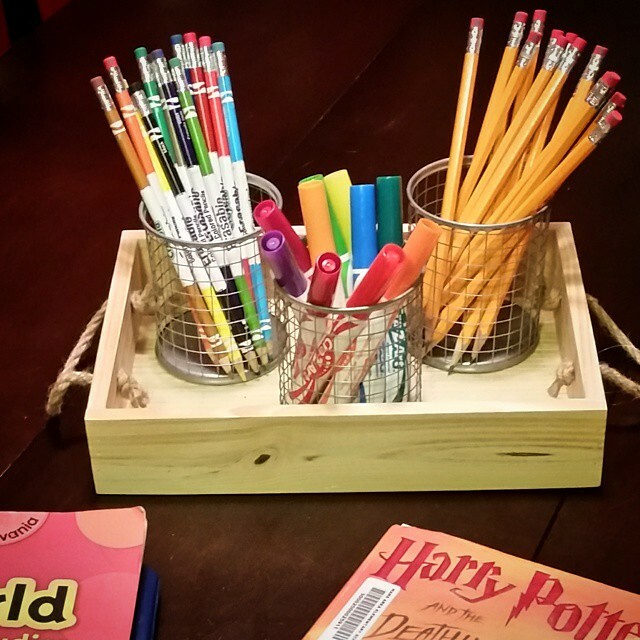 Our Homework Caddy has been sitting on our kitchen counter for months (and being used daily! ), but it was time to update it a bit and get it ready for the upcoming school year. It's such a simple project that makes a big difference! A big bonus? Everything is on sale right now!!! No further instructions are really needed! 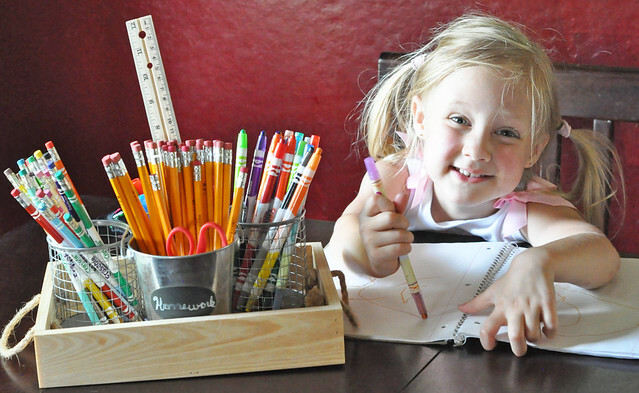 Put the markers, crayons, and colored pencils in the pencil holders. 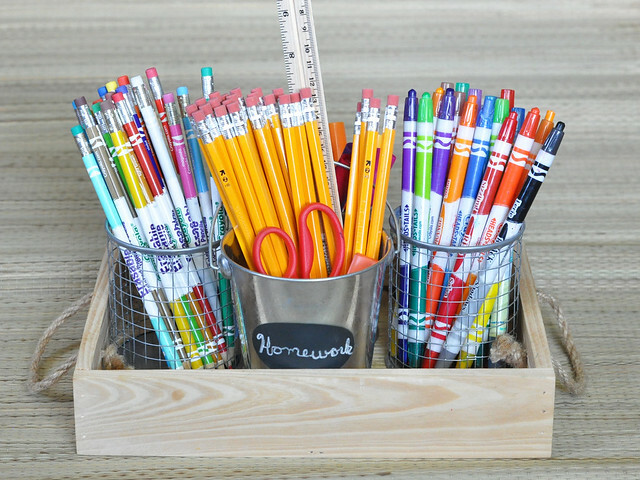 Put the pencils, pencil sharpener, glue stick, ruler, and scissors in the mini bucket (or additional pencil holder if you want to keep it uniform). I opted for a mini bucket with a chalkboard label because it was larger and could hold several items. When you have everything sorted out and organized, put the holders into the caddy. Now everything can be easily carried to the homework spot! Homework (times three!!!) can be stressful, but it definitely helps to have everything we need within reach! Our Homework Caddy is officially finished and ready for the start of the 2015-2016 school year! 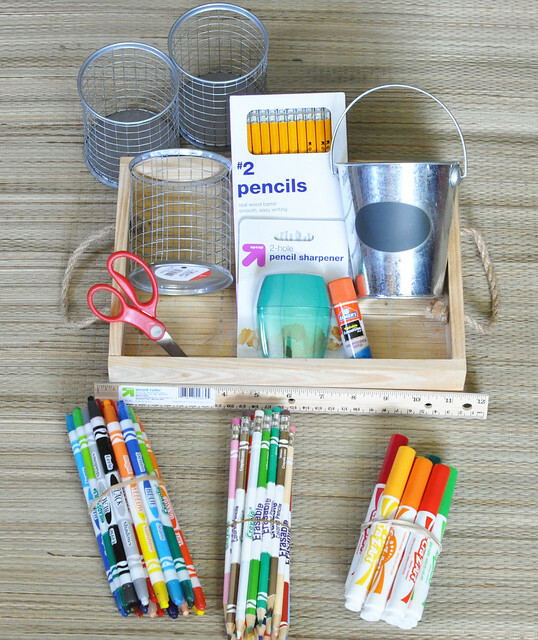 What is your favorite Back To School organization idea? Great idea! Thank you for sharing! Pinning this to create a space before school! Thank you! It's definitely worth it!!! What a really great idea! I'm definitely pinning this! I can't believe school is only 4 weeks away! I love the homework caddy. I need to set one up ASAP. Great idea! I know! The next few weeks are going to fly by. Thank you! You definitely need one, even if it's just for coloring and drawing! Thank you, Tracy! Definitely necessary with 3 kids in school this year! We start back Monday! This summer flew by. That's so soon! Best of luck to your boys! It turned out great! I'm not looking forward to the homework... Thankfully I have a few more years :). Thanks for linking up your back to school post!